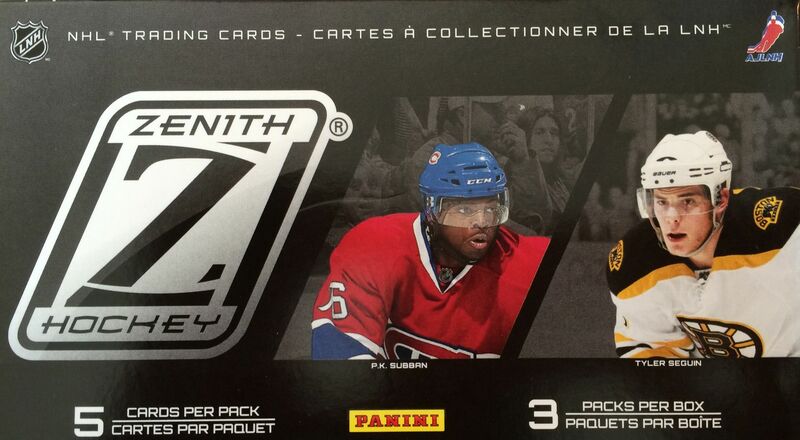 Zenith was one of the brands that Panini tried to re-introduce when they came onto the hockey card scene back in 2010. I remember being pretty excited for the product to release. As it turned out, Zenith was considered to be grossly overpriced. And that turned off many collectors. I never saw a blaster of it at a retail store near me, but I would have a very difficult time justifying the purchase of a blaster at nearly thirty dollars. With Zenith being a 'higher-end' product, Panini gave it the higher-end price and treatment. There are only three packs per box, but should be a hit guaranteed inside. When looking at Zenith, I don't really get the sense of it being higher-end. The base cards are pretty plain - if you compare them to other higher end cards like Panini Certified or even Panini Prizm, these cards are lackluster. 2010/11 was the only year that Zenith saw a release. I think collectors disliked it so much that Panini decided it would not be worth it to try and salvage the brand. Even now at it's extremely discounted price, I think collectors are a bit weary to purchasing it. Besides the rookie content, there just isn't much to latch onto. You're not going to find a huge hit (save for a few select rookie cards) when busting this product. This blaster was a decently fun rip - but short. Though this may be a generally disliked product, I enjoyed it. At first I didn't like the base cards at all. I thought the design was terrible. But they've grown on me a little. Yes, they are plain, but there is a quality about them that does show that there was effort gone into making them. It's hard to see in the video, but the player part of the card has been specially glossed so that it stands out over the background. It's a subtle but nice effect. You don't get a lot of cards in three packs, but I actually prefer getting less base cards to more. Sometimes I just don't know where to put all the excess base that are in these blasters. I like the fact that the box had a hit in it. Companies should definitely think about putting more hits in retail and less base. That would be a great trade-off. I know it would dilute the hit market even more, but perhaps creating retail only hits would be a good idea... just a thought! The veteran cards in Zenith don't have any special designation other than a higher number in the set. I remember the veterans being a bit more limited than that standard base, so that's why Kelly Hrudey gets a spot in the top 3 this week. 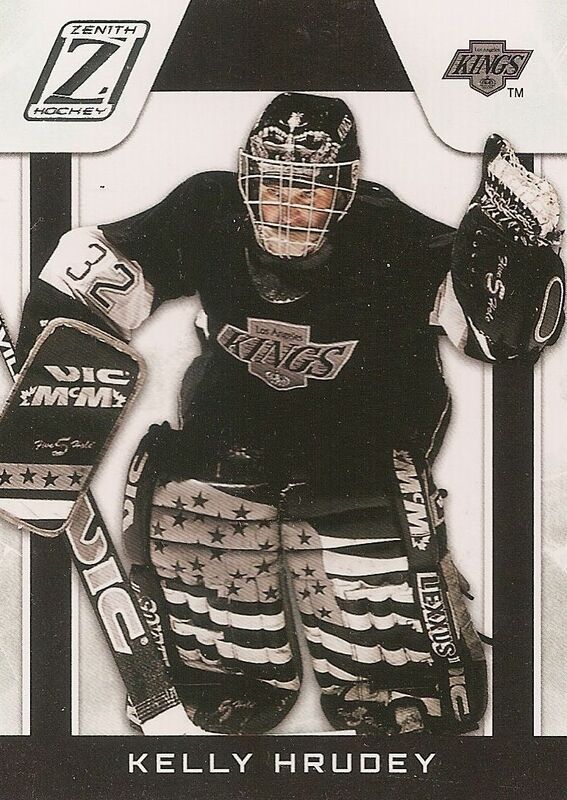 I also have good memories of pulling Hrudey cards back in the old days! 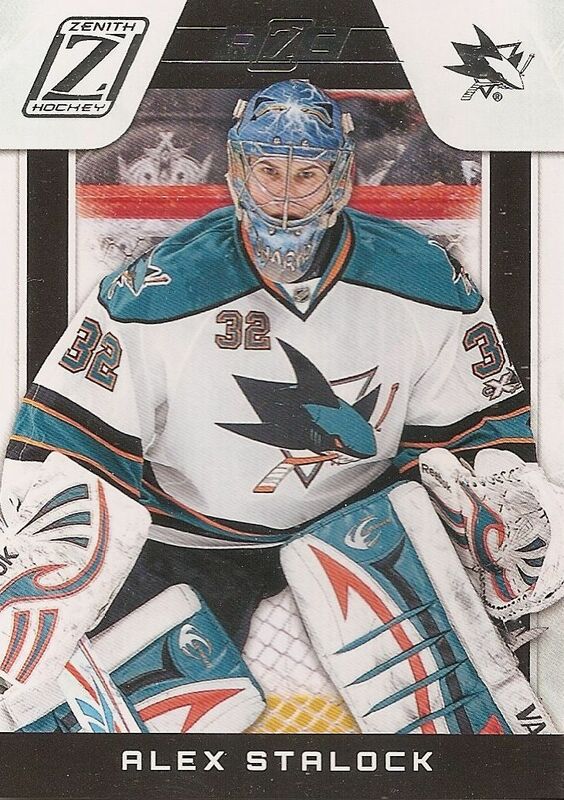 Stalock really came on last year for the Sharks after battling back through a very difficult injury. I know that Sharks were struggling on who to use in goal - Stalock or Niemi. The Sharks recently signed Stalock to a new contract. It looks like he may be with the team for a while. This was the hit in my blaster. 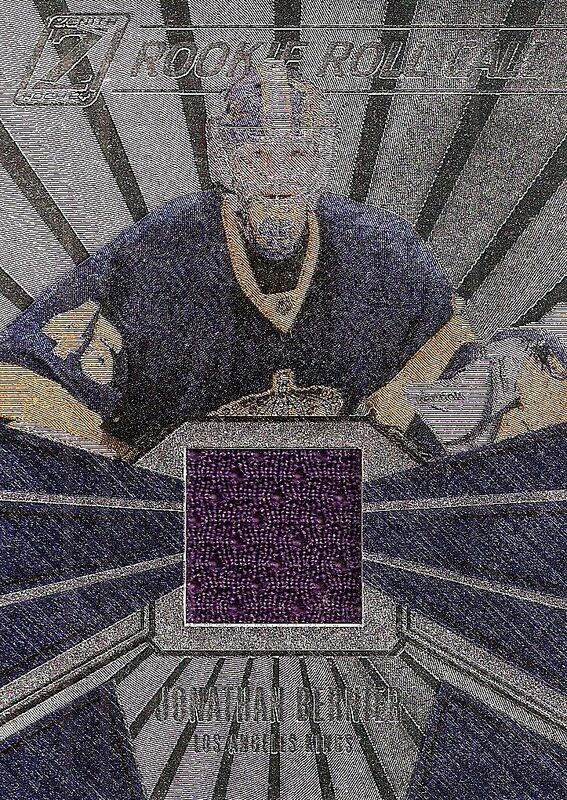 It's a terrible looking scan, but in person the card looks really nice, especially for it being 'just a jersey' card. I especially like the old school purple sweater and sweater chunk. The back states that the piece is game-worn! Zenith is now at a price that is worth it. Spending about $10 for a hit isn't too bad, and I think Zenith is a quirky enough product to really enjoy opening up more of. It's funny how price can really determine how much you like or dislike a product. It just goes to show the importance of getting the price correctly adjusted for the value a product can give. I'd happily open up more Zenith give the chance to. For 10 bucks I guess this is decent. The idea of a hit in a blaster is very appealing to me. As you suggested, retail exclusive hits would be nice (Like the red and blue pulsars of Prizm even though they are not really ''hits''). I never saw Zenith at my local retail stores and I did not know they existed! Keep up posting these retail reviews! I always take a look!